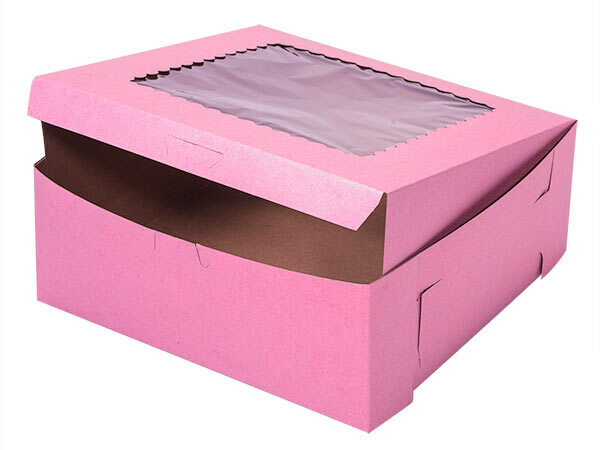 Pink Bakery Boxes with windows are made from 100% recycled material. Front Of Box Folds Down For Easy Front Loading Of Cupcakes And Pastries. Try it with our Cupcake Inserts: CCHR6 to hold 6 regular cupcakes per box or CCHR12M to hold 12 mini cupcakes per box. Green Way® Eco Friendly Packaging. Complies with FDA regulations for food packaging. Made in the USA. Yes! We can print it! Personalize your boxes with a company name and/or logo. Call our Custom Print Department at (800) 547-9727 ext. 4 for details.